FLASH MEMORY SUMMIT 2017 Ana Klimovic (center), a PhD student at Stanford (Prof. Christos Kozyrakis’s group) will present an Invited Talk “ReFlex: A System for Accessing Remote Flash Like Local Flash” on Wednesday August 9, 2017 at 3:20PM. In the photo, Ana chats with Lance Evans (Cray) and Jim Pappas (Intel, seated) in the IAP Booth at the Flash Memory Summit last year. Greetings! Welcome to the IAP Newsletter with items from Q2 2017 as well as upcoming in Q3 and Q4. 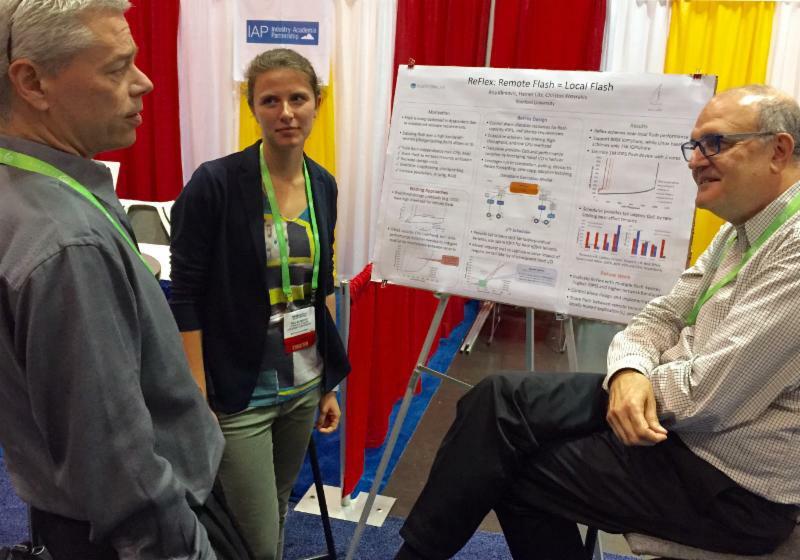 The IAP will host a booth for student posters at the Flash Memory Summit, August 7-10, in the Santa Clara Convention Center. Full-time students may register here for free access using the priority code EDULOC17. Visit us in Booth 638 near the Intel Partners Pavilion. We will also host the Academic Table at the Reception on Tuesday night from 7-8:30pm. Please see the event site for more info. The UT Cloud Workshop is being co-organized by Prof. Derek Chiou in ECE and Prof. Simon Peter in CS for Friday November 10 on the UT campus. 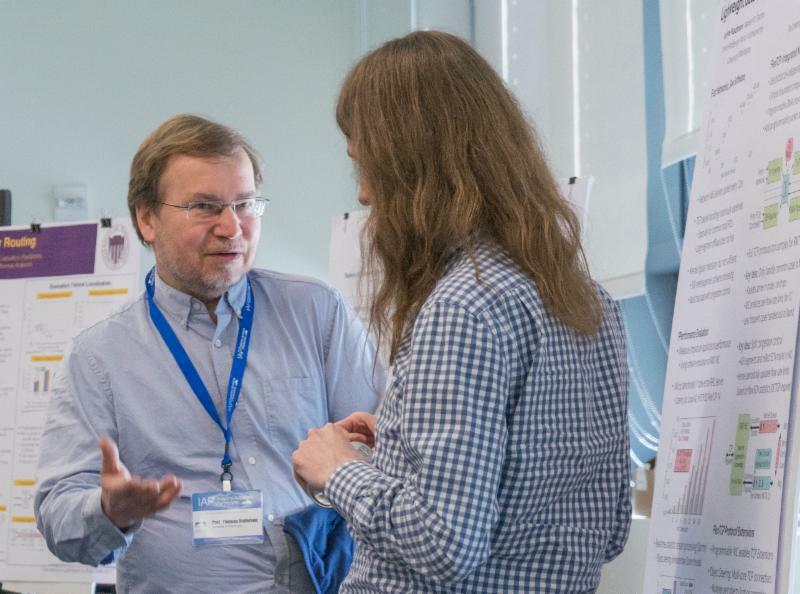 Expect a full day of talks and posters from professors, students and experts in industry. Stuart Byma, Sam Whitlock, Laura Flueratoru, Ethan Tseng, Christos Kozyrakis, Edouard Bugnion, James Larus "Persona: A High-Performance Bioinformatics Framework"
Zhiyu Liu, Irina Calciu, Maurice Herlihy, and Onur Mutlu, "Concurrent Data Structures for Near-Memory Computing"
Raghu Prabhakar, Yaqi Zhang, David Koeplinger, Matt Feldman, Tian Zhao, Stefan Hadjis, Ardavan Pedram, Christos Kozyrakis, Kunle Olukotun “Plasticine: A Reconfigurable Architecture For Parallel Patterns"
Martin Maas, Krste Asanović, and John Kubiatowicz, "Return of the Runtimes: Rethinking the Language Runtime System for the Cloud 3.0 Era"
Scott Beamer, Krste Asanović, and David Patterson, "Reducing Pagerank Communication via Propagation Blocking", 31st IEEE International Parallel and Distributed Processing Symposium (IPDPS-2017), Orlando, FL, May 2017. Bichen Wu, Forrest Iandola, Peter H. Jin, and Kurt Keutzer, “SqueezeDet: Unified, Small, Low Power Fully Convolutional Neural Networks for Real-Time Object Detection for Autonomous Driving”. Computer Vision and Pattern Recognition (CVPR), July 2017. Please feel free to contact us for more info on these items. Photos below are from the IAP University of Washington Cloud Workshop on March 31st in the UW Husky Union Building. 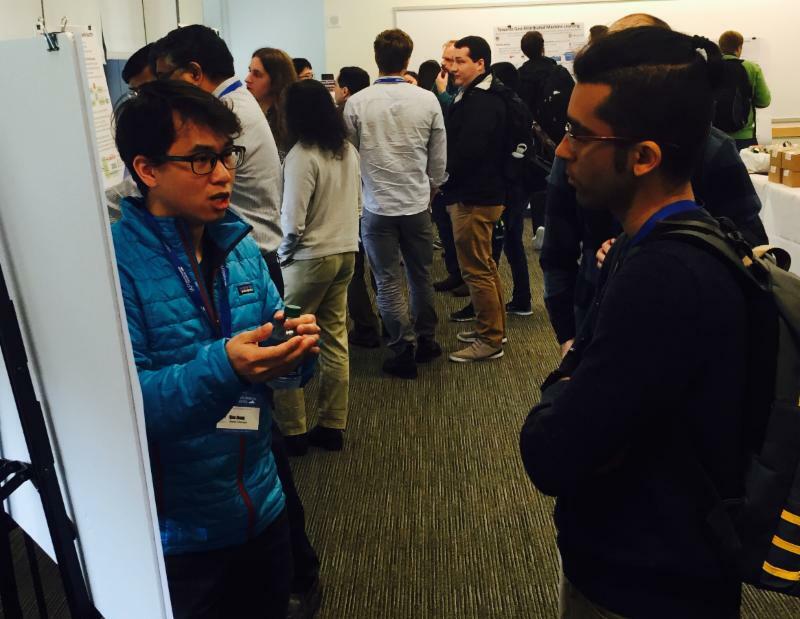 Qiao Zhang (left), a 4th year PhD student at UW describes his research on data center networking during the UW Poster Session. 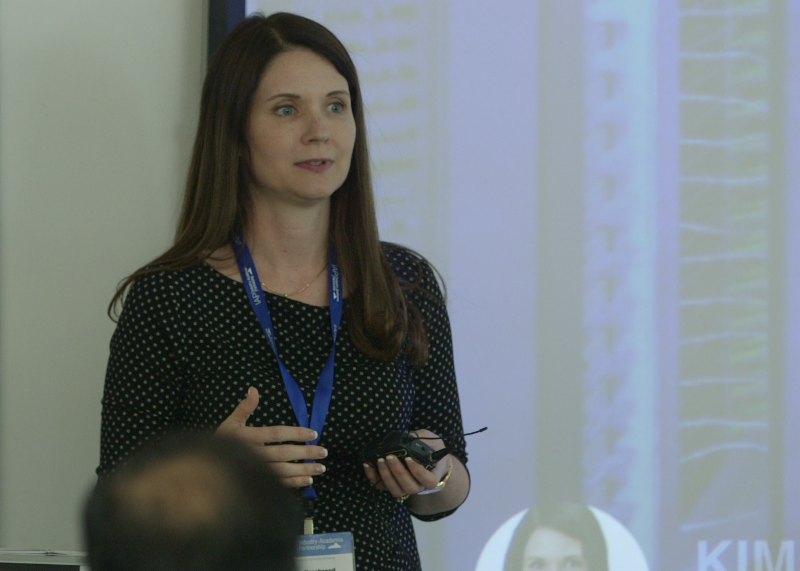 Dr. Kim Hazelwood, Facebook presents "Scalable Performance in Facebook Data Centers" at the UW Cloud Workshop. 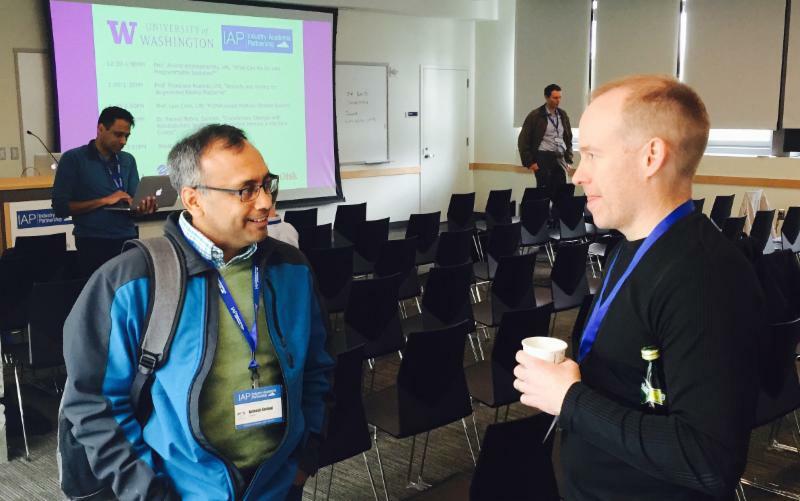 Avinash Sodani (Cavium) and Doug Burger (Microsoft) chat during the morning break at UW. Professor Tom Anderson talks with his grad student Antoine Kaufmann during the UW Poster Session. Several Workshop attendees gathered for a group photo as they enjoyed pizza and each other’s company after the awards were presented at the end of the day.